In heaven there is an upside down fountain. In it a flame is burning day and night. and does not need a wick or oil. and does not know change. The attainment of rubedo, or redness, is symbolized by the transmutation into gold. The alchemists often talk about ‘living gold’. The ‘living gold of the philosophers’ is the pure fire that is in the philosopher’s stone, or in quicksilver, or in the root humidity of nature which is completely penetrated by the fire. The living gold is the fixated seed that vivifies the philosopher’s quicksilver and the matter of the stone, that is the root humidity of metals. It is a light that is clothed by a perfect, pure ethereal body. It all sounds mystifying, but read it again and know that the living gold is actually pure consciousness, or pure awareness. The alchemist has been reborn as the Sun which is equal to Gold. He has been enlightened, he has become light himself, and now he rules over the three kingdoms of nature. Sometimes the alchemists talk about three kinds of gold. The first one is an astral gold, the center of which is in the Sun, it transfers this gold by its rays and with its light at the same time to all the lower planets. It is a fiery substance and it is a constant emanation from the stellar bodies, which permeates the entire universe. Space, the atmosphere on the planets, and the planetary bodies themselves are completely filled with it. We constantly absorb this astral gold by our breath. The astral gold particles then spread themselves all over our bodies. This alchemical description corresponds very well with what is called ‘prana’ in the eastern philosophies. The second kind is the elementary gold. It is the purest and most fixated part of the elements, and of all substances that are made thereof. All living beings of the three nature realms have this priceless elementary gold within themselves. It is also called the central fire of the earth. The third kind is the common metal gold. The alchemists also say that the elementary gold (pure consciousness) is the philosopher’s stone made pure and perfect by the Great Work. From the 12th century on alchemists talked about an ‘agens’ that is necessary for the transmutation. This agens had many names but the most well-known is the ‘philosopher’s stone’. Other names are: the philosophical powder, the great elixir, the quintessence. This philospher’s stone could transmute metals into gold. In the Great Work, the philosopher’s stone is man himself, being at the beginning of the Great Work, or at the very end of it. In general the stone is the universal spirit, present in everything that has been created, and thus also in the alchemist himself. Descriptions of it are many and not always the same. Paracelsus called it fixed and dark red; Berigard of Pisa said that its color is that of poppies, Raymond Lulle said that its color resembled that of carbuncles; Helvetius claimed that it was brilliant yellow. Although many alchemists gave their own, and often contradicting descriptions, Khalid summed it up as “The stone unifies in itself all colors. It is white, red, yellow, heavenly blue and green.” The transmutation is a highly personal process, and thus each alchemist is having a different view on it. Some alchemists were talking about physical substances. The philosopher’s stone is a symbol of perfect man, the end result of the philosophical work. Although it is often connected with quicksilver and sulfur, the philosopher’s stone is difficult to describe with words. We just do not have the proper language for it. “One has never been able to understand what the ancient philosophers meant with the philosopher’s stone. One can not answer this question before one realizes that the alchemists directed their attention on something from the unconscious. Only the psychology of the unconscious can explain the secret. The theory of the unconscious teaches us that as long as this projection is directed onto that something, it remains inaccessible. Therefore the works of the ancient alchemists reveal so little of the secret of alchemy.” (Carl Gustav Jung). One should also consider that alchemists often used symbolic language. Symbols are means to convey information, but it demands a whole different approach of understanding, something we have difficulty with in out modern society. “Almost everybody who has heard about the philosopher’s stone and its power, asks where it can be found. The philosopher always answers twofold. First, they say that Adam has taken the philosopher’s stone with him from Paradise, and that it is now present within you, within me, and within everybody, and that the birds of far countries has taken it with them. Second, the philosophers answer that it can be found in the earth, in the mountains, in the air and in the river. Now what way should one seek? 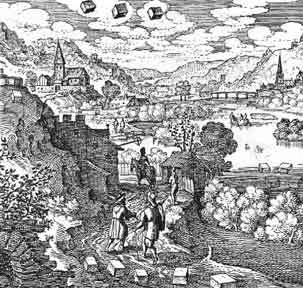 To me, both ways; but each way has its own way.” (Michael Maier, 1617). 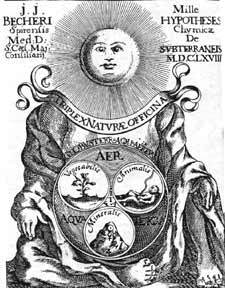 “The philosopher’s stone is first and for all the creation of man by himself, that is the entire conquest of his potentials and his future; it is especially the complete liberation of his will, that will give him the absolute rulership over the Azoth and the realm of magnetism, that is the absolute power over the universal magnetic force.” (Eliphas Levi, 19th century). The philosopher’s stone is also present in the Grail legends. There it is the grail chalice filled with chivalrous and good deeds, that will give back the fertility to the realm of the King. The King in these legends is our higher self, our divine self, the spirit, the heavenly man or Adam Kadmon, that had been cast down into the earthy worlds. Finding this stone, or the divine in oneself and working on oneself to bring it to the surface, will give us access to the Palace of the King. Wolfram von Eschenbach called the Grail a precious stone and the bearer of rich fruit of Wisdom and Purity. The philosopher’s stone can also be seen in relation to the life force. 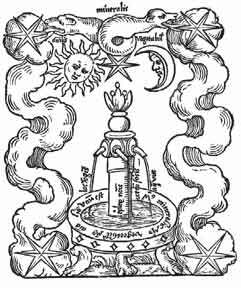 On some alchemical engravings water flows out of a stone. The stone is the philosopher’s stone which is the source of the elixir of life ‘the is like fire but flows like water”. We all have it within us. Meister Eckhart once met a beautiful young boy. And he had made a joke with him. In alchemical terms, the body is reduced into a quicksilver water from which the elixir is then made. In other words a vivifying spirit is made. The elixir is the same as the philosopher’s stone, but the alchemists use the term elixir to talk primarily about its energetic and healing properties. According to some alchemists, the elixir is the second phase in the Great Work, while the tincture is the third phase. As the second phase is albedo, or whiteness, the tincture is also called white tincture. It is the state of cooked or digested matter that has now gained a white color. When it is projected onto metals it changes them into silver. It is a medicine for plants and minerals. We are talking here about a purified spirit (of man) that, although it is only in the second stage, is already healing to body and soul. The red elixir corresponds with the third phase, rubedo or redness. The red elixir is the perfect stone. The Arab alchemists just called it elixir, meaning ‘yeast’. Yeast makes dough rise, what in the philosophical sense means ‘multiplication’. In relation to the elixir, it makes spiritual energy multiply and therefore it works in a healing way in living beings. The elixir cures all ailments, and makes all imperfect metals (like the organs, cells…) perfect (it makes them healthy again). The term tincture is used for its penetrating quality. The tincture is the last degree of transmutation of the natural bodies. It brings all imperfect things to their perfection. Paracelsus calls the tincture a very noble substance that colors all metallic and human bodies, and changes them in a much better essence. It penetrates all bodies and let them ‘rise’ as with yeast. The tincture or elixir is sometimes also depicted as the water of life flowing forth from a fountain, the fountain of youth. Artephius (12th century) wrote in his ‘Secret Book’ that he had been living for a thousand years due to the elixir. Similar statements were done by other alchemists. It is said that the well-known Comte de Saint-German (17th-18th century) did not age because of the elixir. Remember this is not about a physical substance, but it is the divine energy within the alchemist that has been brought forward and that keeps the body young. It always has been a strong idea that there was some kind of liquid, or drink that could prolong the life span and give the body a (near) immortality. Unfortunately common man took this often literally and tried to create a physical liquid. This liquid, or water of life, is a symbolic term for what is present within man himself. In the ancient scriptures of the Hindus (the vedas and the Puranas) one finds the concept of Amrita. Amrita is the drink or food of the gods. It is the food that gives immortality. It was made out of the ocean of milk. The Greek gods drank Ambrosia or Nektar, which had the same characteristics. The alchemists and cabalists speak of the water of life in terms of for example the Ab-e-Hyat or ‘prickling, fiery essence’. More commonly it is called the ‘alkahest’ or common solvent. The alchemist makes his tincture by purifying his body, his emotions and his thoughts, until he identifies himself with his divine essence. When the divine essence has been realized, the water of life pours forth and takes away all remaining dross, leaving pure gold. The elixir or tincture makes a new man from the alchemist. He is reborn and immortal. He partakes of divine wisdom and unity with the Source of all. He has become a heavenly king.